If you are interested in purchasing our integral blinds and would like a FREE quote then please fill in the quick form below. One of our expert team will reply to all queries as soon as they are received, if you have any questions about our integral blinds or if you are unsure about something then please contact us, we will be happy to help. Thanks. Our Integral Blinds are the most advanced blind system on the UK market today, our blinds are the ultimate blind solution. No more cords, wand or fiddly knobs our advanced blind system gives your windows a blind that is not only convenient, but also the safest type of blind on the market. 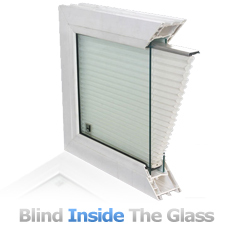 Our integral blinds or integrated blinds as they are also known, are controlled by two discretly hidden powerful magnets, that with ease control the operation of the blinds, allowing you to raise, lower and tilt the blinds with its simple innovated design. This in turn controls when you need privacy and allows you to control against glare and sunlight which keeps the room at a more controlled temperature. Our exclusive venetian style blind sits inside a double glazed argon gas filled unit, which protects the blind from damage, dirt and grime. Which means the blind never needs cleaning and is completely maintenance free. Say goodbye to your blinds gathering dust and the need to keep them clean.